Ancient folklore from around the world rings with two resonating themes: History moves in cycles with alternating Golden and Dark Ages, and the slow movement of the stars across the sky, the Precession of the Equinox, is the cause and timekeeper of these cycles. For years we have heard that these are only myths, there was no Golden Age and precession is just a wobbling of the Earth’s axis. 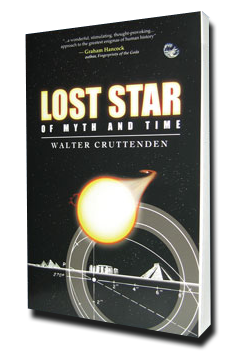 Now Lost Star of Myth and Time shows evidence the Ancients were not just weaving fanciful tales – science is on the verge of an amazing discovery – our Sun has a companion star carrying us through a great cycle of stellar influences. If true, it means the Ancients were right and our views of space and time and the history of civilization will never be the same. More than that, it would mean we are now at the dawn of a new age in human development and world conditions.